Studies published in English (from their inception to December 2016) were mainly identified by conducting a systematic search in PubMed, Web of Science, and Cochrane Library databases using the following terms: “IL-10,” “1082 A/G (rs1800896),” “819 C/T (rs1800871),” and “polymorphism.” Reference lists from relevant articles were also examined to find additional publications. Data were extracted independently by two authors using standard forms. The collected data included author name, publication year, country, study design, genotyping method, and genotype distributions. All the included studies met the following criteria: (1) case-control study focused on Chinese Han population, (2) evaluation of the association between IL-10 promoter region (1082 A/G (rs1800896), 819 C/T (rs1800871)) polymorphism, and AP risks, (3) including details of genotype frequency in cases and controls and the frequency was tested by Hardy-Weinberg equilibrium (HWE). Studies were excluded when they were: (1) not case-control study, (2) review, comment, or editorial articles, (3) insufficient data, and (4) repetitive studies. Evaluation of evidence strength was carried out according to the modified Newcastle–Ottawa Scale [Supplementary Table 1]. Study flow diagram is shown in [Figure 1]. Eight studies of IL-10 promoter region (1082 A/G (rs1800896), 819 C/T (rs1800871)) polymorphism, and AP risks were found in a primary literature search in PubMed, Web of Science, and Cochrane Library databases. After reviewing each publication, two articles were found inappropriate in the current meta-analysis because they focused on British and Spanish populations. Six studies with 1403 cases and 1384 controls shown in [Table 1] were identified appropriate for the current meta-analysis.,,,,, The genotype distribution of the control population was in agreement with Hardy–Weinberg equilibrium in all six studies [Table 2]. We analyzed the association between IL-10 promoter region (1082 A/G (rs1800896), 819 C/T (rs1800871)) polymorphism, and AP risk within five genetic models as mentioned in the Methods section. The quantitative synthesis results are presented in [Table 3]. Interestingly, the pooled results revealed a significant association between 1082 A/G (rs1800896) polymorphism and AP risk in all these five models (AG/AA: OR = 1.19, 95% Cl = 1.02–1.40, P = 0.03; GG/AA: OR = 1.80, 95% Cl = 1.38–2.23, P = 0.01; AG+GG/AA: OR = 1.29, 95% Cl = 1.11–1.50, P = 0.01; GG/AG+AA: OR = 1.62, 95% Cl = 1.27–2.08, P = 0.01; G/A: OR = 1.29, 95% Cl = 1.15–1.45, P = 0.01). In contrast, no statistically significant association was found in all these five models (CT/CC: OR = 1.14, 95% Cl = 0.94–1.36, P = 0.14; TT/CC: OR = 1.14, 95% Cl = 0.91–1.43, P = 0.25; CT+TT/CC: OR = 1.14, 95% Cl = 0.97–1.35, P = 0.11; TT/CT+CC: OR = 1.07, 95% Cl = 0.87–1.31, P = 0.55; T/C: OR = 1.09, 95% Cl = 0.97–1.22, P = 0.15) for 819 C/T (rs1800871) polymorphism. The funnel plot was performed to estimate the publication bias. The shape of the funnel plots was symmetrical, suggesting that there was no evidence of publication bias for the IL-10 promoter region (1082 A/G (rs1800896), 819 C/T (rs1800871)) polymorphism [Figure 2]. Begg's test showed no evidence of publication bias (P = 0.851). To assess the stability of the results, sensitivity analysis was performed. The sensitivity analysis did not detect any individual study, which affected the results using the exclusion method step by step [Figure 3]. Dufour MC, Adamson MD. The epidemiology of alcohol-induced pancreatitis. Pancreas 2003;27:286-90. Venneman NG, Renooij W, Rehfeld JF, VanBerge-Henegouwen GP, Go PM, Broeders IA, et al. Small gallstones, preserved gallbladder motility, and fast crystallization are associated with pancreatitis. Hepatology 2005;41:738-46. Frossard JL, Morel P, Pastor CM. Why clinical trials might succeed in acute pancreatitis when they failed in septic shock. JOP 2003;4:11-6. Ozhan G, Yanar HT, Ertekin C, Alpertunga B. Polymorphisms in tumour necrosis factor alpha (TNFalpha) gene in patients with acute pancreatitis. Mediators Inflamm 2010;2010:482950. Bishehsari F, Sharma A, Stello K, Toth C, O'Connell MR, Evans AC, et al. TNF-alpha gene (TNFA) variants increase risk for multi-organ dysfunction syndrome (MODS) in acute pancreatitis. Pancreatology 2012;12:113-8. Srivastava P, Shafiq N, Bhasin DK, Rana SS, Pandhi P, Behera A, et al. Differential expression of heat shock protein (HSP) 70-2 gene polymorphism in benign and malignant pancreatic disorders and its relationship with disease severity and complications. JOP 2012;13:414-9. Gulla A, Evans BJ, Navenot JM, Pundzius J, Barauskas G, Gulbinas A, et al. Heme oxygenase-1 gene promoter polymorphism is associated with the development of necrotizing acute pancreatitis. Pancreas 2014;43:1271-6. Tang B, Chen YK, Luo WJ, Fu J, Sun JM. Association between interleukin-10 -1082A/G, -819C/T and -592C/A polymorphisms with deep venous thrombosis. Hum Immunol 2014;75:203-7. Ying B, Shi Y, Pan X, Song X, Huang Z, Niu Q, et al. Association of polymorphisms in the human IL-10 and IL-18 genes with rheumatoid arthritis. Mol Biol Rep 2011;38:379-85. Kang JM, Kim N, Lee DH, Park JH, Lee MK, Kim JS, et al. The effects of genetic polymorphisms of IL-6, IL-8, and IL-10 on Helicobacter pylori-induced gastroduodenal diseases in Korea. J Clin Gastroenterol 2009;43:420-8.
de Beaux AC, Goldie AS, Ross JA, Carter DC, Fearon KC. Serum concentrations of inflammatory mediators related to organ failure in patients with acute pancreatitis. Br J Surg 1996;83:349-53. Berney T, Gasche Y, Robert J, Jenny A, Mensi N, Grau G, et al. Serum profiles of interleukin-6, interleukin-8, and interleukin-10 in patients with severe and mild acute pancreatitis. Pancreas 1999;18:371-7. Chen CC, Wang SS, Lee FY, Chang FY, Lee SD. Proinflammatory cytokines in early assessment of the prognosis of acute pancreatitis. Am J Gastroenterol 1999;94:213-8. Eskdale J, Gallagher G, Verweij CL, Keijsers V, Westendorp RG, Huizinga TW. Interleukin 10 secretion in relation to human IL-10 locus haplotypes. Proc Natl Acad Sci U S A 1998;95:9465-70. Kilpinen S, Huhtala H, Hurme M. The combination of the interleukin-1alpha (IL-1alpha-889) genotype and the interleukin-10 (IL-10 ATA) haplotype is associated with increased interleukin-10 (IL-10) plasma levels in healthy individuals. Eur Cytokine Netw 2002;13:66-71. Sargen K, Demaine AG, Kingsnorth AN. Cytokine gene polymorphisms in acute pancreatitis. JOP 2000;1:24-35. Jiang BZ, Tang L, Xue H, Liu DP. Role of IL-10 gene polymorphisms in the development of acute pancreatitis. Genet Mol Res 2016;15. doi: 10.4238/gmr. 1502774. Zhang DL, Zheng HM, Yu BJ, Jiang ZW, Li JS. Association of polymorphisms of IL and CD14 genes with acute severe pancreatitis and septic shock. World J Gastroenterol 2005;11:4409-13. 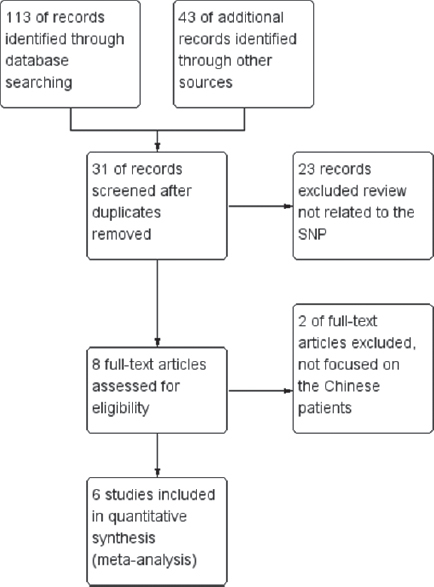 Zhao L, Roffey DM and Chen S. Association Between the Estrogen Receptor Beta (ESR2) Rs1256120 Single Nucleotide Polymorphism and Adolescent Idiopathic Scoliosis: A Systematic Review and Meta-Analysis. Spine (Phila Pa 1976) 2017;42:871-8. Lau J, Ioannidis JP, Schmid CH. 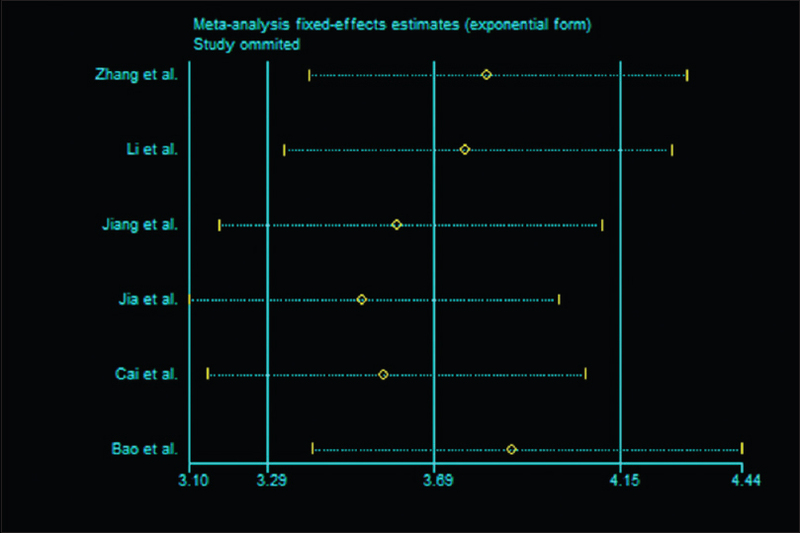 Quantitative synthesis in systematic reviews. Ann Intern Med 1997;127:820-6. Wang X, Lu X, Fang Y, Chen H, Deng X, Peng C, et al. Association between mir34b/c polymorphism rs4938723 and cancer risk: A meta-analysis of 11 studies including 6169 cases and 6337 controls. Med Sci Monit 2014;20:1977-82. Li D, Li J, Wang L, Zhang Q. Association between IL-1beta, IL-8, and IL-10 polymorphisms and risk of acute pancreatitis. Genet Mol Res 2015;14:6635-41. Jia HL, Sun PL, Lu CQ. Investigation of the association between interleukin-10 polymorphisms and risk of acute pancreatitis in a Chinese population. Genet Mol Res 2015;14:15876-81. Cai F, Cui N, Ma H, Wang X, Qiao G, Liu D. Interleukin-10 -1082A/G polymorphism is associated with the development of acute pancreatitis in a Chinese population. Int J Clin Exp Pathol 2015;8:15170-6. Bao XB, Ma Z, Gu JB, Wang XQ, Li HG, Wang WY. IL-8 -251T/A polymorphism is associated with susceptibility to acute pancreatitis. Genet Mol Res 2015;14:1508-14.
de-Madaria E, Martinez J, Sempere L, Lozano B, Sanchez-Paya J, Uceda F, et al. Cytokine genotypes in acute pancreatitis: Association with etiology, severity, and cytokine levels in blood. Pancreas 2008;37:295-301. Schneider A, Barmada MM, Slivka A, Martin JA, Whitcomb DC. Analysis of tumor necrosis factor-alpha, transforming growth factor-beta 1, interleukin-10, and interferon-gamma polymorphisms in patients with alcoholic chronic pancreatitis. Alcohol 2004;32:19-24. Schneider A, Barmada MM, Slivka A, Martin JA, Whitcomb DC. Transforming growth factor-beta1, interleukin-10 and interferon-gamma cytokine polymorphisms in patients with hereditary, familial and sporadic chronic pancreatitis. Pancreatology 2004;4:490-4.